An entertaining money magic trick with an incredible finish !!! This is one of the most baffling dollar bill tricks ever! This cool illusion has been performed on a television magic special. The trick had an amazing effect on the audience and was a real crowd winner. Read the secret of this great illusion, here. to show the notes, restored to their original condition, Incredible !!!! The magician places them back to back, he/she then cuts through the center of both notes with a pair of scissors - the notes are clearly seen to be cut into four halves. # You can let a spectator cut the notes! # Amazing magic that is EASY to perform! The Secret: This is one of the greatest dollar bill tricks, it's an excellent "cut and restored" illusion that is really effective when performed with real money. You can use play money, fake money, blank cheques or any form of printed paper about the size of regular currency. First you need some secret preparation. Place two nearly new bills face down on a table. Apply a thin ayer of rubber cement, about half an inch wide down the centre of the back of each note. When this is dry, add a second coat of rubber cement and allow that to dry also. (Pic 1) What's rubber cement? Its a type of craft glue that dries to a rubbery finish and can normally be purchased from a hardware store or perhaps on Ebay. Next, sprinkle a little talcum powder (baby powder) on the cement covered area on each bill. Spread the talcum powder over the entire surface of the cement with your finger or a soft brush. You will notice that the treated areas of both dollar bills will not stick to each other because of the powdered surface. Put the bills in your wallet or purse or on the table and you are ready to perform this very well thought out close up effect! The Method: Begin by removing the two prepared notes from your wallet/purse and casually show both sides of the notes. Place them back to back as shown in(Pic 2 & 3). We will call the note nearest you Note A and the one nearest the spectators Note B Square up both notes. Be sure that the cemented areas are touching each other. Hold both notes with the thumb and finger of your left hand as shown in (Pic 4). 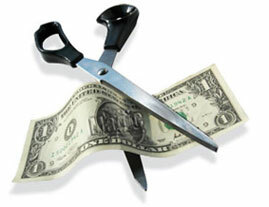 With your right hand holding the scissors, carefully cut through the center of both notes. Make sure that you cut within the areas covered by the cement stripes. Done openly and deliberately, there will be no doubt in the audiences mind that both bills have been cut in half - which they have! ( Pic 5). Place the scissors aside. Grip the halves on the right sides of the cut in your right hand (one half of Note A and one half of Note B) and the left side's two halves (the other two halves of Note A and Note B) in your left hand. With the thumb and fingers of both hands, separate the halves of the notes (Pic 6), and shake them open (Pic 7). Because of the rubber cement, the halves in each hand will stick together at the cut edges giving the illusion that the four half notes have melted together to form two complete notes once again! The reason this is one of the most convincing dollar bill tricks in my mind is because the spectators see and hear the notes being cut, so it is that much more believable when they are 'restored' people freak out with astonishment!!! TIP 1: Done well, this is a real show stopper! First practice with stage money or with newspaper cut to the size of bank notes. This way you can experiment as to what is the best amount of rubber cement and talcum powder to apply. You can then try it with real bills.. 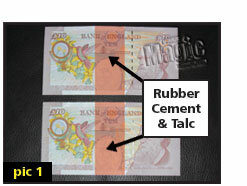 TIP 2: The real notes should be new and crisp (maybe from a cash machine) and fit snugly together for pics 3 and 4. TIP 3: Don't worry about losing money when using real notes, as the halves can be stuck together with clear Scotch tape, just as with any torn notes. be really brave and use $ 20 notes! (or equivalent). TIP 5: As an alternative method you could let an audience member cut the notes just make sure you hold the notes tightly together and get them to cut in the centre (where the rubber cement is!) Practice your hand position while holding the notes so that it will seem a natural and unforced choice for them to cut over the part of the notes that you want. This is one of the easiest dollar bill tricks to perform but remember to practice lots to enable you to feel confident performing it in front of a spectator, smoothly. The trick is lots of fun and frequently gets an amazing reaction. Don't forget to check out the Ultimate Torn And Restored Bill Trick which is also on this site.